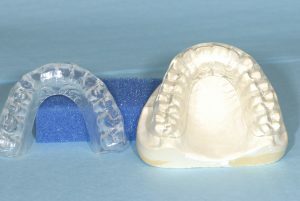 At Thompson Suburban Dental, we can fabricate custom-fit TMJ splints, nightguards and mouthguards for your patient. We rely on high-quality products from Flexite-PM, Astron CLEARsplint and Proform sport guards to produce a comfortable removable prosthetic your patient will be satisfied with. 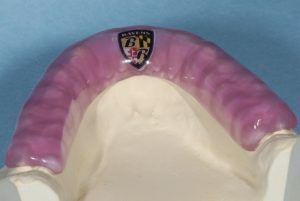 In addition to our trusted products, we can conveniently customize any mouthguard to the design that you would like. Tanner appliances (night guards, occlusal splints, bite splints, etc.) are designed to protect the teeth from nightly clenching and bruxing. Our occlusal splints are processed with Flexite MP-injected clear resin featuring full coverage with flat, even opposing contacts, canine rise and posterior disclusion. Our premium splints can be fabricated on either arch and modified to your exact design requirements and construction bite registration. We can process hard occlusal splints or a hard/soft splint, which has an inner layer of permasoft. When warmed, this hard/soft occlusal guard provides comfort for the patient and easy delivery for the dentist. Astron clear splints are fabricated to the same standards as the Flexite MP except the entire splint is constructed from a soft thermosplastic material. Its optical clarity is nearly invisible while wearing and its breakage-resistent composite resin is strong and has great stability, which makes it ideal for bruxism patients. Laboratory-processed professional grade Proform sport guards are prescribed for both the professional and amateur athletes because they offer the highest level of protection, retention, comfort and fit, without interfering with speech or breathing during play. Proform has the advantage over boil-and-bite types of mouth guards because of their superior fit and retention. In addition, Proform mouth guards are thin, comfortable, custom fitted and will retain their shape long after other mouth guards have worn out. These sport guards are available in many colors and team logos can be incorporated into its design. Contact us to discuss nightguards, mouthguards and TMJ splint options that meet your patient’s needs. Nightguards prevent headaches and migraines caused by involuntary night-time teeth clenching or grinding and also aid in correcting many TMJ issues. A night-guard is a thin, often transparent device that is worn over the biting surface of the teeth while asleep which prevents contact between the upper and lower teeth. Nightguards are offered in hard, soft, and combo; each alternative offers slightly different results, aesthetics, and solutions. These nightguards provide the most durability and are usually made from a hard acrylic. These may be the best options for those with bad clenching issues and TMJ. The soft option is for those with minor to moderate clenching habits. A soft nightguard is considered to be more comforatabe, as well as economical, however, the soft material it is made from is subject to deformation over time. Because a soft nightguard is more economical, it is also advisable for patients who are testing a nightguard out and may make the decision to purchase a hard nightguard. Combining both the comfort of the soft guard and the durability of the hard nightguard, a combo is made from a soft material for comfort while the exterior is a harder material. The outer casing is designed not to chip, crack, or break, and helps to protect teeth while maintaining it’s shape consistently under stress. All three nightguards are available from Thompson Suburban and are completely customizable. The NTI-TSS (Nociceptive Trigeminal Inhibition Tension Suppression System) is a small plastic device designed to prevent headaches and migraines caused by teeth clenching and grinding. It is an anterior bite stop, worn over the two front teeth at night to prevent contact with the upper and lower teeth. This device decreases the strength of the jaw clenching by triggering a nerve reflex that relaxes the muscles, while preventing the molars from touching. An NTI is another customizable alternative to a nightguard and are available through Thompson Suburban.